Make a decor statement with this exclusive Kathy Ireland torchiere floor lamp. 72" high overall. Base is 11" wide. Torchiere glass is 15" wide. 9' brown cord. 5' from base to in-line switch. Torchiere takes one maximum 150 watt standard-medium base bulb. Side lamps each take one maximum 60 watt standard-mediumbase bulb (bulbs not included). Foot switch with dimmer for top light. On-off button for side lights. Kathy Ireland Sonnett floor lamp in a bronze finish. Champagne alabaster glass. Wanted a sturdy lamp that wouldn’t take up too much space in a small room. Also liked the dual options of this lamp - good for reading as well as TV watching. Wanted to purchase a torchiere lamp and we currently have Kathy Ireland lamps, Amor line, so this one will complement our current lamps. Design goes very well with my room colors. Love the two reading lamps. Loved the style and functionality. I was looking for an affordable antique bronze finish torchiere with two side lamps for my living room. I think this style and finish will work well. I had a Kathy Ireland floor lamp in the past that I really liked. My golden retriever tripped over the cord and the globes broke. This lamp is a replacement for one we were really satisfied with. I LIKE THE STYLE. HAVING THREE LIGHTS IS A PLUS FOR US. THE REVIEWS ARE POSITIVE AND HELPFUL. On Sale and I liked it! It is exactly what I need need and of good quality! Plus on sale so that is an extra plus! I really like that the lamp is tall. And the two extra side lights are perfect. I chose the Kathy Ireland Sonnett floor lamp for the height, color of the lamp also color of the glass fixtures and for the floor dimmer switch. 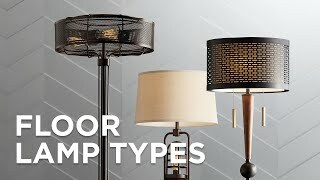 I chose to buy the lamp online from Lamps Plus for the good pricing. I look forward to the delivery of the lamp. Loved the look of the lamp and felt it was a great value. I chose this lamp because it has two reading lights, the incredible sale price, and free shipping! My mom wanted a floor lamp that would also be good for reading, so the extra small lights on the side were ideal. It looks sturdy. Worried about the double cords that some say look messy though. Also concerned about the horribly messy packaging that was talked about. I hope there is a way to tuck the cords so they are not too bulky on the floor. Price and design on top and bottom of base. I need replacement lamps and this one seems to fix both the lighting requirements as well as style. Been looking for a torch floor lamp and this fit my decor and good price. Room upward light and the side lights for reading. I have a KATHY IRELAND lamp already and LOVE IT! Three lights in one and the finish. I love it more than the first one I originally ordered! This received good reviews. Worried glass might be too white, but we'll see. for two chaired reading nook. Purchased as a gift for my daughters home. Love it and it is on a great sale. I have many Kathy Ireland lamps from you. I have had this same style lamp for a couple of years. Design provides lots of light directed dinner table so you can see what you are eating. Style beautiful not garish. Looks old fashioned without being out of date. Hopefully workmanship will be fine, and it will require no or very little assembly. I wanted a light to illuminate the whole living room when the family plays games or friends are visiting. The dimmer will be great when kids are sleeping and we just want to watch a movie. Small lights will work for reading a book, working on the computer, etc. 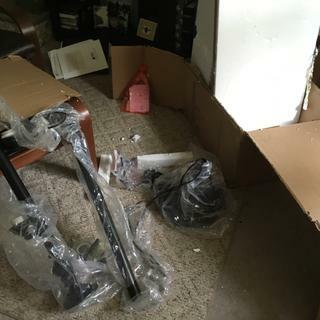 I had actually ordered 2 floor lamps different, brands although somewhat similar types. When I opened the Kathy Ireland box (which I just happened to open first) I fell in love with it immediately and decided to order the recommended coordinating lamp. Which I just ordered.. I am returning the other one unopened. It is nice also but I love the Kathy Ireland lamp I chose. The top light came on initially when plugged in, but later the top light went off and I cant get to come on again. What am I doing wrong? BEST ANSWER: Hi - I am sorry, a replacement switch is not an available part listed for this model. How high is it from the floor to the first light? Does the top 150 watt diffuse the light horizontally ... or does the light just go up vertically? BEST ANSWER: Hi - It measures 39" high to the first light and the top glass shade provides soft diffused light horizontally as well. How high is the first lamp from the floor? We want to use it between two chairs so two people can read at the same time or individually. BEST ANSWER: I can’t give you exact measurements but I used the lamp in home library study between two chairs and torchiere as lighting for book shelves. It was exactly what I needed. You can adjust the brightness with the floor switch. The first lamp is 45 1/2” from the floor. The second one is 55”. I measured from the floor to where it attaches to the pole. Hope that helps. I love this lamp! Thank you. It sounds perfect for my needs. The base of the first lamp from the floor is 45 inches. Can the glass bowl on top of lamp be replaced? Can I purchase a side lamp shade to replace a broken one? Will it work with dimmable LED? BEST ANSWER: Yes the large light on the top has a dimmer switch. The two smaller light simply are on/off and not dimmer lights. Yes, it works just fine with a dimmable LED. I only use LEDs in my lamps. Yes, it works fine with a dimmable LED. I only use LEDs in my lamp. Yes — all 3 bulbs in mine are dimmable LED and work beautifully. Can you adjust or move the lower lights to point them toward a chair or sofa? BEST ANSWER: Hi, the lights can swivel 180 degrees. Does the lamp cover come in a white instead of the champagne color? BEST ANSWER: Hi, this floor lamp is only offered with the champagne color glass. When I turn on the foot pedal only the side lights come on the top light does not. Am I doing something wrong or is it broken? BEST ANSWER: Hi, the push button only turns the side lights on. the top light is turned on using the slider on the foot switch. What does foot switch mean? BEST ANSWER: It includes a 9 foot cord and is switch is located 5 feet from the base. There is a black box attached to the cord that plugs the lamp into an outlet. It has a slider on it that operates the lights. You can move the slider with your foot. Where along the cord is the black box connected? Near the plug, along the middle or what? And how long is the cord? Just received this lamp. I need clarification on the maximum wattage. I can use a 150 for the torchiere and 60 for each side lamp which is a total of 270 as opposed to 150 total? BEST ANSWER: Hi, for the top light you can use one bulb up to 150W max. For the two side lights you can use one bulb for each light up to 60W max. Can you turn on one of the small lamps and not the other or do both of small lamps need to be on at the same time? BEST ANSWER: Both of the small lamps turn on at the same time. You cannot have just one turned on and not the other. They both will be on at the same time. If I want only one on, I loosen the other light bulb. Both are on at the same time. You can turn one away if it’s too much light. Both smalllamps at same time. Large torch light can be dimmed. You cannot turn just one small lamp on. Has to be both. Can the side lamps be used as reading lamps? Can brighter bulbs be placed in them? BEST ANSWER: Yes, the side lights make perfect reading or task lamps. You can adjust them and aim them as you'd like, so they are very reader-friendly. The side lights use maximum 60 watt bulbs, but you could use LEDs that would have a brighter lumens output than a regular incandescent, just so long as you don't exceed the 60 watts maximum. I just received my new lamp and I love it. However, there is no way, that I can find, to turn off the torch light, except by pulling the plug. Can someone tell me how to turn it off? BEST ANSWER: There is a foot switch with dimmer for top light and on-off button for side lights. We have this lamp and it has a dimmable slide to turn it on and off. It is designed to be used on the floor but we have it on the couch which we find to be more convenient. I hope this helps. Have you tried sliding the foot pedal back and forth, also there is a button on the end of the foot pedal that will turn the unit off. There's a slide on top of the controller that acts a dimmer switch. Slide it as far as it can go and the light is off. BEST ANSWER: The base measures 11" in diameter. Where are the switches for the reading/task lights? BEST ANSWER: The foot switch has two controls. The slide operates the dimmable light on the top. The spring loaded push button operates the two small reading lights. It is a separate button for the reading lamps from the main large lamp but both on the same control pad. I like it as it gives me lighting options. does the top light require a 3 way bulb for the dim feature? BEST ANSWER: No, a 3-way bulb is not required. I just put a 150W bulb in and it easily adjusts to whatever brightness you like. The dimmer is very heavy duty and slides easily. i DON'T THINK SO - I JUST PUT IN THE BULB THAT CAME WITH IT AND IT DIMS NICELY, ITS A BEAUTIFUL LAMP! How do I replace a broken Torchiere glass for this lamp? Can you use LED light bulbs in this lamp? BEST ANSWER: Absolutely! The sockets for this lamp are medium based and will accept medium based LED bulbs. We just read on the dimmer switch that it can only be used with incandescent bulbs. That is correct Barbara. I should have clarified that in my original response. You can use LED bulbs in this fixture for on/off operation. The dimmer switch is designed for incandescent use only. Some customers have found that the dimmable LED's still work with the dimming function but the dimmer is designed for incandescent use only. Hope this helps! Can anyone tell me the height of the lowest stem light from the floor? Thanks! BEST ANSWER: From the bottom of the lowest stem to the floor is 38 inches. From the top of the lowest stem to the floor is 47 inches. All measurements are approximate because you can't measure exactly to the floor because the base is in the way. I hope this helps. We are very pleased with this lamp. I actually measured it @ 46 inches. About 3 ft 9 1/4 in. This is a beautiful traditional style lamp. It is heavy/sturdy. I love that the torchiere lamp has a dimmer to control the light. We found it easy to place the bulbs in the side lights but, while they do move from a down position to a mid way point, they will not STAY in any position except down position. I wish the lower lamp was a bit higher to better light the desk it is near. 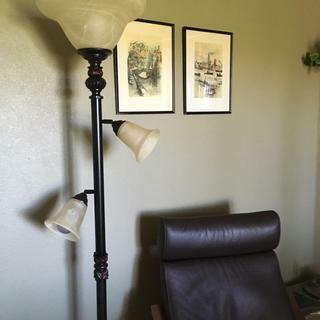 The two side lamps do not move horizontally and both are tilted toward one side so the lamp has a natural back/front position (hope this makes sense). This is my 2nd purchase of this lamp! We liked this lamp so much that we replaced it with a new one when ours was accidently pushed over and broken. It illuminates the room without using the ceiling lights or on a lower wattage it provides ambiance lighting for TV watching or relaxing. The only challenge is replacing the small bulbs on the side lamps. 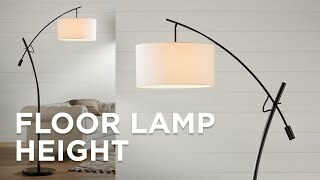 This provides great flexibility....light option on nice..
My wife and I were looking for something that really complimented our living room and reading area and this lamp solved both problems. I love to be able to turn the two individual lights in two directions. And the overhead light can be adjusted by the dimmer. This is a beautiful lamp. It is sturdy and looks wonderful when lit. The assembly was average, not quick, but not overly difficult. The packing however disintegrated all over the floor, so cleanup was a bit messy. 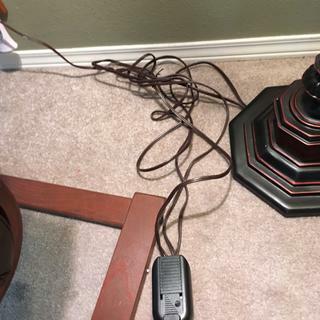 We should mention a couple of features that were not clear in the online description: there is a double cord coming out of the lamp to the foot pedal. This just creates more bulk on the floor and is not neat and tidy looking. Also, while the upper light can take a 100 watt bulb and the two side lights are rated for 60 watts each, there is a warning attached to the cord that the wattage should not exceed 180. Does not add up to the max for each fixture, but you need to determine yourself where you want your wattage. The shades are great and sturdy. This lamp sits nicely between my living room chairs. I really like the two lower directional lights for reading. When they are off the upper light on a dimmer adds nice mood light. It was delivered quickly and there was no damages in the delivery. Delivered as promised. Packed nicely - nothing broken. I use this lamp behind a chair in a corner of my family room. It is perfect for reading and to give the room a bit of soft lighting to the rest of the room when entertaining. It great that you can adjust the brightness to the top light and independently light the other two lights. I only wish that the two smaller lamps on this pole had more positioning movement in them. They move well but I could have had them move just a bit more. Looks great in our living room. Perfect. Very prompt service! It's a beautiful lamp. Very sturdy. I'm enjoying it. Taking the lamp out of the box/styrofoam took two people. Were afraid we were going to rip the cords. Would appreciate more environmentally and human friendly packing. Also -no instructions on how to safely pull the cords through the post, start to peel the plastic coating off of one since the passage was so tight. Lamp looks good and works. Also disappointed that the only switch is the floor switch and with 3 separate cords on the floor they are messy looking. I'm not sure if I am using it correctly.. the top bulb does not dim?? Do I need a special bulb for that? What are the type of bulbs you suggest? And can I do each bulb on the bottom seperately? I can't figure that out either? Hello Pamela A., thank you for reaching out - our customer service team has emailed you instructions for how to operate the design properly, but for anyone else who may happen to read this - the top bulb dims when using a dimmable bulb and the foot switch. The side lights use a separate on/off button which turns both lights on or off at the same time - they do not light independently. Thank you! This floor lamp Lights up dark corner of room and while I play my keyboard I can direct separate light to my music . I put lamp together fairly easily before I discovered the directions. It is a beautiful lamp, and I like the dimmer feature. This lamp meets all our expectations, it is accurately described on this site. The company was easy to work with and we were thrilled when it arrived before Christmas with free shipping. Easy to assemble and operate. Beautiful lamp and very well made! This lamp is very sturdy and well made. It was easy to put together and provides great lighting options. The lamp fits well with my living room decor. I would highly recommend this lamp and would buy it again if the need arose elsewhere. High quality flour lamp - dimming is perfect for room ambiance - side lights really help my wife when knitting or reading - we both loves this lamp - recommend if you looking for extra light but ability to control how much. I absolutely LOVE this lamp. 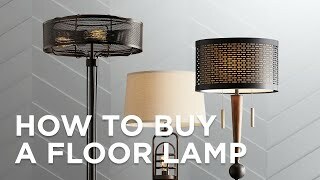 Searching the internet and lamps are either cheap/cheap-y or way spendy. Hard to decipher a good, value priced lamp. Look no further - this is it! I didn't even realize until I put it together that the top light has a dimmer. Bonus!! Love it very rich looking. This lamp is perfect. The lighting has many options, a lot or a little, it is beautiful and versatile as you can point the light in many directions. Will purchase another one for my office. The lamp is gorgeous, exactly as represented. It arrived in perfect condition and was very easy to assemble. WE love it. Lamp was exactly as described and just what we hoped for so we placed an order for the table lamps in the same series. Kathy Ireland torchiere is great! This is such a pretty, classy looking lamp. It looks more expensive than it is. I like that you can turn on just the top (up-facing) lamp, which gives a soft, warm, indirect light to the room, but for more intense light and for reading, you can use just the smaller side lights, with or without the top one. No delivery I carried this in my vehicle. Delivery was prompt. Called service during installation and got courteous assistance. This lamp is very eye appealing and is well made. Very sturdy! It's perfect for any room. Excellent lamp for price and quality. Bought this as a gift for my daughter in law’s birthday. I have one similar and she has always wanted it. I wrapped the huge box and made her put it together herself. Lol. Really nice lamp. Fits perfectly in their living room. Good price too. I’m retired so price is important. Other models similar were double!! So I was very happy. She’s very happy!! Thank you Lamps Plus!! Oh, and very fast delivery!! Yes I would highly recommend this lamp. The color is perfect and it is very sturdy. The lighting is just what we needed. My mom loves the 2 lamps in her assisted living. The foot control is wonderful for her and they are just gorgeous! I like how the two lower lights can be adjusted. The lamp is so pretty & looks great but I don’t like the switches,I’d much rather have a little button switch on the pole!! But still like it!! Lamp nice, but picture is deceptive. Glass is white, not amber. Trying to find glass shade locally that will match other fixtures I have. Otherwise beautiful and works well. Nice features with the marbled glass. It gives good lighting to the room. It was however a little work connecting the pole to the base and pulling the cord through as well as correcting the leaning. Otherwise a good addition for the price. I have this lamp in the living room and it really brightens it a lot! Love the additional reading lights on it as well. The lamp is great. Had to get emplaced due to shipping issue bur the customer service was exceptional. I had to return it because the upper light stopped working after a week. It was so easy and pleasant. I have it back home and it is working great! I think this lamp is very sturdy and beautiful, however; the wiring is questionable and I thought the foot on/off switch box was in addition to switches at the individual shades. There are no switches on the lamp and my foot switch doesn't dim the large lamp as described, it only shuts it on or off and the same goes for the small lamps, but I have to unplug it to get them all to turn off. I will call customer service and go from there..
Hi Karen D., very sorry to hear that you're having some trouble with the switches on your floor lamp. To clarify some concerns, we would like to note that the top light can be dimmed using the included foot switch. There should be a separate switch that controls the side lights. When both of those switches are in the "off" position, all the lights should turn off. Our customer service team would be more than happy to assist you with more detailed information. Please reach out to them via phone, email, or chat. Thank you. Top bulb base not assembled to center shaft(missing two screws). Have e-mailed distribution center in Redlands but no answer yet. Hi Daniel N., thank you for your patience, I'm very sorry for your experience with this lamp, and we'd like to get this resolved for you as soon as possible. I have passed your review comments on to our customer service team here who will look into this and reach out to you directly for assistance. Thank you for your feedback.